It’s been five years in the making but Fernando Alonso on Saturday finally tasted victory again in top-level competition. 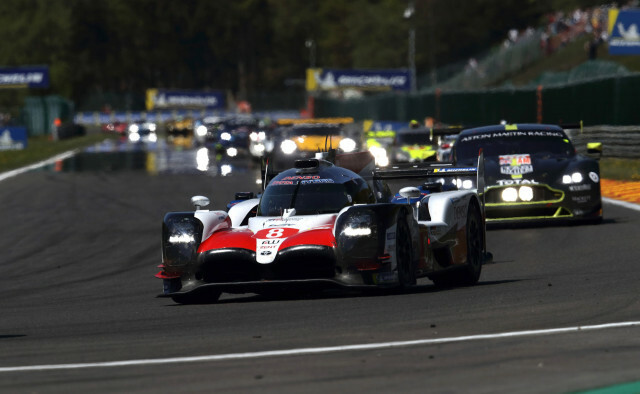 Driving for Toyota, the Spaniard won the opening round of the 2018/2019 World Endurance Championship, the 6 Hours of Spa-Francorchamps, together with teammates Sébastien Buemi and Kazuki Nakajima in the No. 8 TS050 Hybrid. The last time he stood at the top of a podium was all the way back at the 2013 Formula 1 Spanish Grand Prix, at the time driving for Ferrari. With Porsche no longer in the WEC, Toyota is the sole manufacturer in the premier LMP1 class and the favorite to take out the championship. 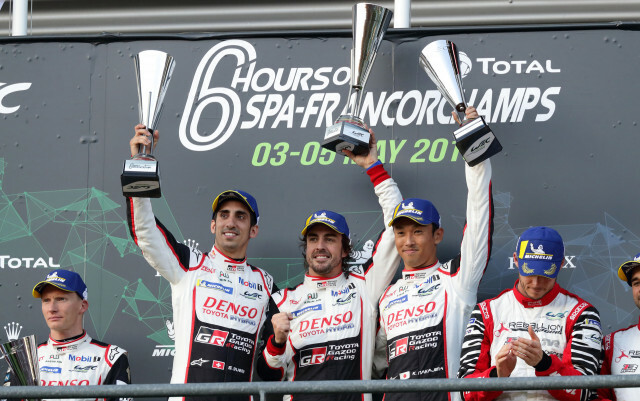 It was a one-two finish for the Japanese automaker at Spa, with the No. 7 TS050 Hybrid driven by Mike Conway, Kamui Kobayashi and José María López crossing the finish line 1.444 seconds back. It was an impressive finish considering the No. 7 car started from the pit lane, a lap behind the entire field, after a post-qualifying technical infringement. Crossing the line third was the No. 1 Rebellion Racing R13 of André Lotterer, Neel Jani and Bruno Senna. Sadly, though, the car was later disqualified after the post-race measurement of the skid block did not comply with regulations. In the GTE Pro class for production-based cars and professional drivers, first place went to the No. 66 Ford GT driven by Olivier Pla, Stefan Mücke and Billy Johnson. Second place went to the No. 92 Porsche 911 RSR of Kevin Estre and Michael Christensen, while third was claimed by the No. 71 AF Corse Ferrari 488 GTE Evo of Davide Rigon and Sam Bird. The next race on the WEC calendar is the 24 Hours of Le Mans, which runs the weekend starting June 16. Toyota is poised to take home its first win in the French classic after periodic participation dating back to the 1980s, while for Alonso it potentially means a second jewel in his dream of winning motorsport’s Triple Crown, i.e. the Monaco Grand Prix, the Indy 500 and the 24 Hours of Le Mans. So far he’s only got the Monaco win under his belt.